Senate President, Dr. Abubakar Bukola Saraki on Thursday called on Nigerians to join hands with the present administration to make the country great again, by supporting its policies and programmes aimed at restoring full security across the country and revamping the economy. 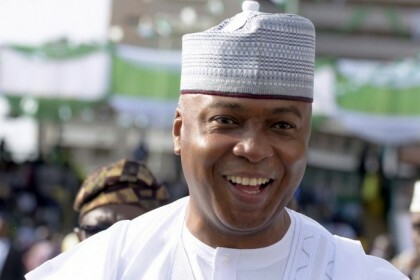 Saraki in a New Year message to Nigerians signed by his Special Adviser, Media and Publicity, Yusuph Olaniyonu, in Abuja, congratulated the people as they mark the New Year festivities and for their resilience and patience especially in the face of daunting economic challenges. He said that the need for effective collaboration between the people and the Federal Government – led by President Muhammadu Buhari – is imperative to overcome the nation’s most pressing socio-economic challenges and to make the nation prosperous once again. He added that the present government is working to ensure the world stops talking of the potentials of Nigeria and move on to counting the achievements and progress recorded by our country as the true giant of Africa and major player in world politics. The Senate President noted that the Federal Government through the nation’s Armed Forces and the support of all Nigerians have recorded tremendous success in the fight against insurgency while pointing out that intense collaboration between the citizenry and government is needed more than ever before to prevent incessant attacks from Boko Haram and eradicate all forms of criminality in the land. He commiserated with all victims of suicide attacks during the Christmas celebration and said he was greatly encouraged by the determination displayed by the security agencies so far in their efforts to effectively close that sad chapter of the nation’s history. Saraki said: “I am delighted that we are celebrating the New Year not only in peace but as a united country to the shame of doom’s day prophets that predicted that this country would not survive the year 2015. Notwithstanding the negative predictions, we are today marking the New Year as one indivisible country and more than ever before determined as a people to live together in peace, love and unity. “This is why it is crucial for the government and the people to continue to work together to ensure total restoration of security in every nook and cranny of the country and to set the nation’s economy on the path of progress once more. Nigeria is the only country we have. Let’s unite to defend and make her the greatest country in the continent,” Saraki stated. He urged all citizens who are aggrieved over any issue to always explore the various available constitutional means of seeking redress and resolution rather than resorting to means that will create tension and bring benefit to nobody. The Senate President pledged that the National Assembly would continue to fashion out appropriate legislative instruments that would bring succour to Nigerians, boost economic growth and strengthen the fight against corruption and insurgency in the land. Special Adviser, Media and Publicity to the Senate President.